Click on figure to view full size. 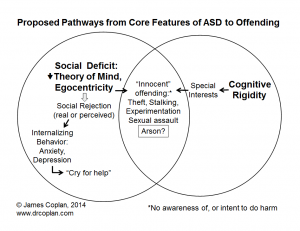 Dr. Coplan maps the connections between social rejection, internalizing behavior, and suicide risk in persons with autism spectrum disorder. Internalizing behavior usually does not trigger criminal offending, but it can be the prequel to violent externalizing behavior. 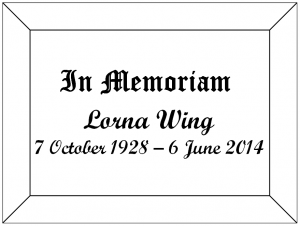 The British psychiatrist Lorna Wing passed away last month, after a long career dedicated to bettering the lives of persons with ASD, including her own daughter. 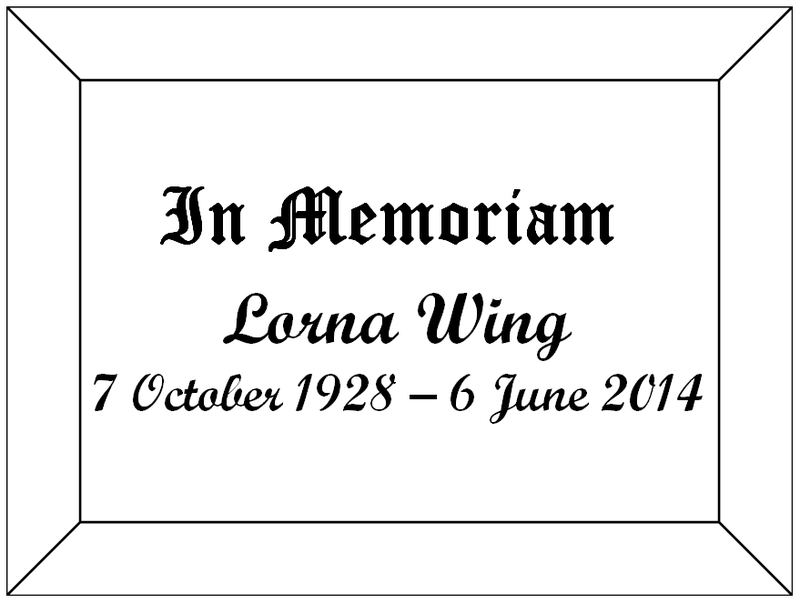 It was Lorna Wing who in 1981 coined the term “Asperger Syndrome.” This blog post is dedicated to her memory and legacy. 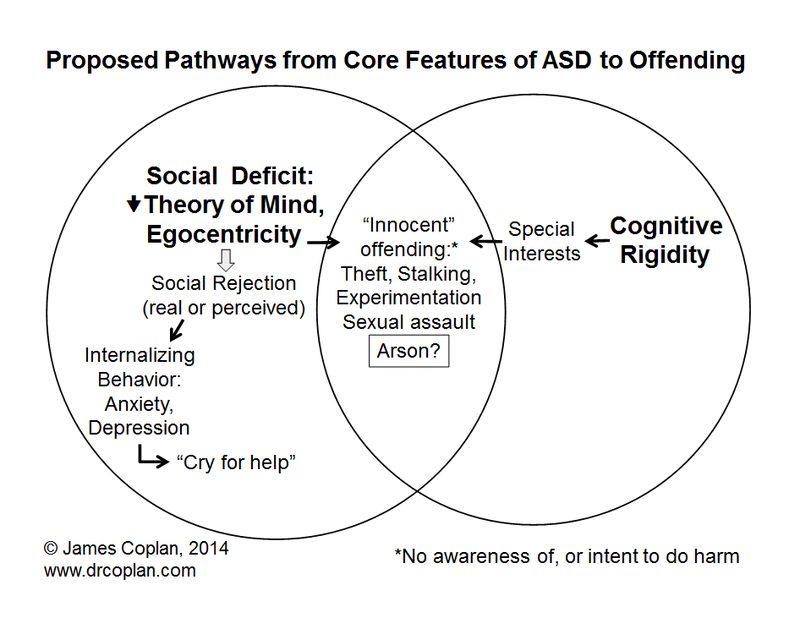 In our last post on the subject of ASD and crime, I introduced the term “innocent offending” to describe criminal behavior stemming from the combination of obsessive interests and lack of social awareness (Items 1-4 in Wing’s list). Here, I’ve added another pathway to the diagram, this time leading from social rejection to internalizing behavior. The top 3 causes of death in adolescents and young adults with neurotypical development are accidents, homicide, and suicide (and many “accidents” are probably covert suicide). Depression is common in ASD, yet we know almost nothing about suicide risk in youth with ASD. A recent study in Lancet conducted among adults with newly diagnosed Asperger Syndrome found that 66% had entertained thoughts of suicide, and 35% had made plans on how kill themselves, or carried out a suicidal attempt, at some point in their lives. These data are not drawn from a randomly selected subset of persons with AS, so they may not apply to all persons with AS or high-functioning autism, but they are deeply concerning. Internalizing behavior does not typically lead to crime. Unfortunately, internalizing behavior is often ignored – until it erupts into externalizing behavior. More on that next time. 1. Wing, L., Asperger’s syndrome: Management requires diagnosis. Journal of Forensic Psychiatry, 1997. 8(2): p. 253-257. 3. Cassidy, S., et al., Suicidal ideation and suicide plans or attempts in adults with Asperger’s syndrome attending a specialist diagnostic clinic: a clinical cohort study. The Lancet Psychiatry, 2014. Internalizing behavior is all the emotional stuff we hold inside. Internalizing behavior does not typically lead to crime.